with a few drops of Selcon is advantageous as long as it still eats the Brine Shrimp. I also suggest feeding small amounts three or four times daily. 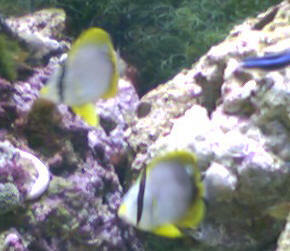 Might want to look through our FAQs on Butterfly Fish feeding for more ideas/suggestions. 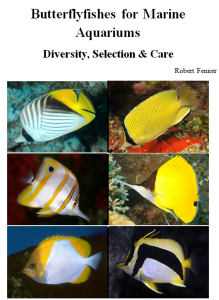 Promised Bob I would send this, hoping it might help others with these beautiful, but delicate, finicky creatures. I purchased three b/f fish mail-order, a Pakistan, a Saddleback and a Pearlscale. Tried every frozen and dry fish food known to man, but could not get the fish to eat anything except live, on the half-shell, clams and mussels. The Pakistan did not eat for three weeks (I was worried to say the least! ), then finally ate the clams and mussels. After a few more weeks I got the Saddleback and Pearlscale eating flake, with the Pearlscale also eating frozen Mysis and the Saddleback eating frozen bloodworms--only! The Pakistan finally started eating something other than live food but only from my hand (spoiled, I know!) -- and that was freeze-dried Tubifex worms! What a pain at feeding times but what a great sense of achievement. The Saddleback and Pearlscale now eat anything I throw into the tank and still LOVE their flake food (Spectrum products). They mostly eat frozen Mysis, Angelfish Formula and the occasional mussel or clam, although I noticed that they tend to quarrel whenever live food is offered (must bring out the territorial nature more than flakes do:)). fortunately neither of the other fish were troubled by the same illness. I recently purchased a latticed b/f fish and upon seeing it asked the pet store employee what it had been eating and they replied live brine shrimp (what else?). I asked them had they tried flake and they looked at me rather strangely because everyone knows b/f fish don't eat flake food! They popped some flakes into the tank and the latticed b/f fish started eating. When b/f fish pass the flake test they are a keeper as far as I am concerned. It too now eats everything I throw into the tank. The information at WWM helped me considerably through those difficult first few weeks with my picky eaters, especially information regarding feeding (the use of worms, mussels, clams, oysters to induce eating). Hope this helps someone else in a tough situation with b/f fish. In closing, don't be scared to try the flake foods too, it just might get them eating. <Wise words. With a little time and dedication many picky eaters can be gradually transitioned to dried and frozen foods. More on the Roa, Chaetodon mitratus Hi guys, <Brandon> I'm still working with my cute as a button 2" specimen of C. mitratus. As mentioned in the previous question, my attempts at feeding him have still failed. <Though the members of this subgenus are remarkably aquarium "tough", a 2" individual is too small... 3-4 inches overall is ideal to start> A brief recap, purchased from Marine Center about 2 weeks ago, shipped excellent. Within 10 minutes of acclimation was exhibiting natural behavior of picking at rocks in full view. I have tried meaty pellet food soaked in Selcon, no interest at all. I've tried frozen Mysis shrimp, to which he swims directly up to, almost examining it, then leaves it alone to start picking at liverock again. <May well be deriving sufficient nutrition from the rock> The only thing I've gotten him to eat are live brine on two occasions. Even that was a weird experience. Instead of absolutely gorging itself like all other fish I've seen, it ate a couple will little gusto. It is constantly picking at the rock, showing me a desire to feed. I have a fairly high amphipod population, but should that be enough that it wouldn't care about easy handouts at the trough? Seems to be in great health, not terribly shy. Only housed with a similarly sized P. hepatus. <Does the specimen appear very thin?> An off the record question: do you guys, if you aren't sure, or for further advice, have access to Scott Michael's email? I'm sure he is probably a friend of Bob's, and I know he has much expertise with Roa butterfly's. I'm not asking for the email address myself, but maybe a forward if you wish. Please do not get me wrong, I am in no way implying that this staff isn't capable, I'm just worried and varied opinions often produce results as someone may have had a similar situation. <I have BCC'd Scott here. Bob Fenner> Thanks gang, I'm just worried about this precious fish. 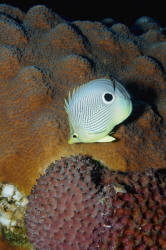 What do you feed a Copperbanded Butterflyfish? 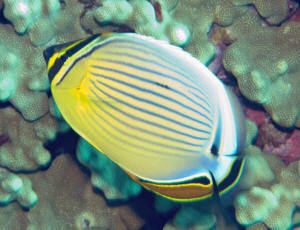 hey what's up> I am typing to talk to you about a Copperbanded Butterflyfish. I am getting one tomorrow. I would like to know the things I need to do to acclimatize it. << Okay, well first, don't get set on buying one tomorrow. It is better to ask these questions well before hand. To acclimate the fish, I would recommend floating the bag for 20 minutes, then gently scooping him out of his bag, and putting him in your tank. >> and what is its feeding habits. and one more thing what is it sensitive to. Copperbanded Butterfly Fish (Chelmon rostratus) Hi, I would just like to say that my Copperbanded butterfly is eating.<good> I thought, because he loves to nip and tear at the feather duster I'll put the muscle strands from the whole muscles in the tube. At first he didn't seem interested, but after a while he came up and sniffed it, and once the dwarf angelfish began to nip at it a pull it out, he shot for it a eat the whole thing which is about 2 inches long!<nice> And the butterfly fish is only 3inch. And now when I feed him the muscles, he's straight for them. I am very pleased with this, and I hope it helps other owners of this fish <thanks for the information and good luck with this fish, IanB> Regards Aaron. Re: butterfly question I'd love to add a tank-raised saddleback butterfly. Would it be OK with these tank mates? <<Not in this size tank - your tank is full.>> Thanks, I thought I was at/near max. Prob going to move damsel, it's getting too big.